Science has now been for a long time—and to an ever-increasing extent—a collective enterprise. Actually, new results are always, in fact, the work of specific individuals; but, save perhaps for rare exceptions, the value of any result depends on such a complex set of interrelations with past discoveries and possible future researches that even the mind of the inventor cannot embrace the whole. In Oppression and Liberty (1955, 1958), 109. The interrelations of mathematics with science are as rich and various as the texture of science itself. In 'Mathematics in the Physical Sciences', Scientific American (Sep 1964), 211, No. 3, 129. The more experiences and experiments accumulate in the exploration of nature, the more precarious the theories become. But it is not always good to discard them immediately on this account. For every hypothesis which once was sound was useful for thinking of previous phenomena in the proper interrelations and for keeping them in context. We ought to set down contradictory experiences separately, until enough have accumulated to make building a new structure worthwhile. Lichtenberg: Aphorisms & Letters (1969), 61. 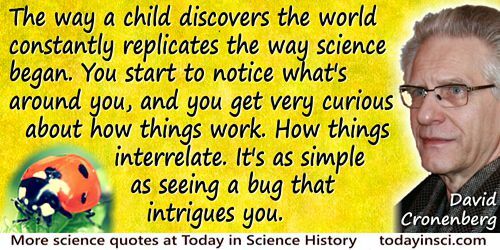 The way a child discovers the world constantly replicates the way science began. You start to notice what’s around you, and you get very curious about how things work. How things interrelate. It’s as simple as seeing a bug that intrigues you. You want to know where it goes at night; who its friends are; what it eats. In David Chronenberg and Chris Rodley (ed. ), Chronenberg on Chronenberg (1992), 5. There are three stages in the development of science: First, there is the observation of things and facts—the scientists map out and inventory the objects in each department of Nature; secondly, the interrelations are investigated, and this leads to a knowledge of forces and influences which produce or modify those objects…. This is the dynamic stage, the discovery of forces and laws connecting each fact with all other facts, and each province of Nature with all other provinces of Nature. The goal of this second stage of science is to make each fact in Nature throw light on all the other facts, and thus to illuminate each by all. … Science in its third and final stage learns to know everything in Nature as a part of a process which it studies in the history of its development. When it comes to see each thing in the perspective of its evolution, it knows it and comprehends it. In Psychologic Foundations of Education: An Attempt to Show the Genesis of the Higher Faculties of the Mind (1907), 378. There is no area in our minds reserved for superstition, such as the Greeks had in their mythology; and superstition, under cover of an abstract vocabulary, has revenged itself by invading the entire realm of thought. Our science is like a store filled with the most subtle intellectual devices for solving the most complex problems, and yet we are almost incapable of applying the elementary principles of rational thought. In every sphere, we seem to have lost the very elements of intelligence: the ideas of limit, measure, degree, proportion, relation, comparison, contingency, interdependence, interrelation of means and ends. To keep to the social level, our political universe is peopled exclusively by myths and monsters; all it contains is absolutes and abstract entities. This is illustrated by all the words of our political and social vocabulary: nation, security, capitalism, communism, fascism, order, authority, property, democracy. We never use them in phrases such as: There is democracy to the extent that… or: There is capitalism in so far as… The use of expressions like “to the extent that” is beyond our intellectual capacity. Each of these words seems to represent for us an absolute reality, unaffected by conditions, or an absolute objective, independent of methods of action, or an absolute evil; and at the same time we make all these words mean, successively or simultaneously, anything whatsoever. Our lives are lived, in actual fact, among changing, varying realities, subject to the casual play of external necessities, and modifying themselves according to specific conditions within specific limits; and yet we act and strive and sacrifice ourselves and others by reference to fixed and isolated abstractions which cannot possibly be related either to one another or to any concrete facts. In this so-called age of technicians, the only battles we know how to fight are battles against windmills. From 'The Power of Words', collected in Siân Miles (ed. ), Simone Weil: An Anthology (2000), 222-223.